Five years ago, the aliens came. other time travelers are after both of them. while being hopelessly outnumbered in the battle of the sexes? The chaos starts in this first book! A (Not So) Healthy Dose of Chaos is a sci-fi/fantasy series set in the not-too-distant future, in which aliens have made themselves known to the Earth. The novel contains an abundance of action, comedy, drama and space-time manipulating antics. The novel will be available in January 2013, first through Lulu.com, then through other channels, with an eBook version available if popularity dictates. Until then, check the free preview below! 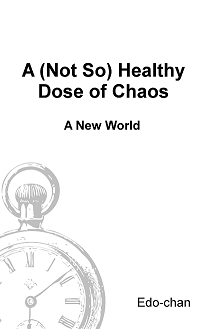 February 27, 2013: The eBook version of A New World is available for free on Smashwords! January 14, 2013: A New World is now on sale! December 9, 2012: The Chaos web page goes live!